Powder room, water closet, half bath ... no matter what you call the spatially challenged room that houses a toilet and a sink, one thing will always remain the same: it can be a real head-scratcher to design. How do you add personality and put your creative spin on such a teeny, tiny space? And is it possible to make it look and feel a little larger than it actually is? These are all valid questions, and, lucky for us, many designers and homeowners alike have already done the hard work. Using clever space planning and gorgeous materials, they've seemingly mastered the art of making a half bath seem a lot more ... well, whole. Scroll on for 15 steamy half bathroom ideas that will jump-start your tiny redux. 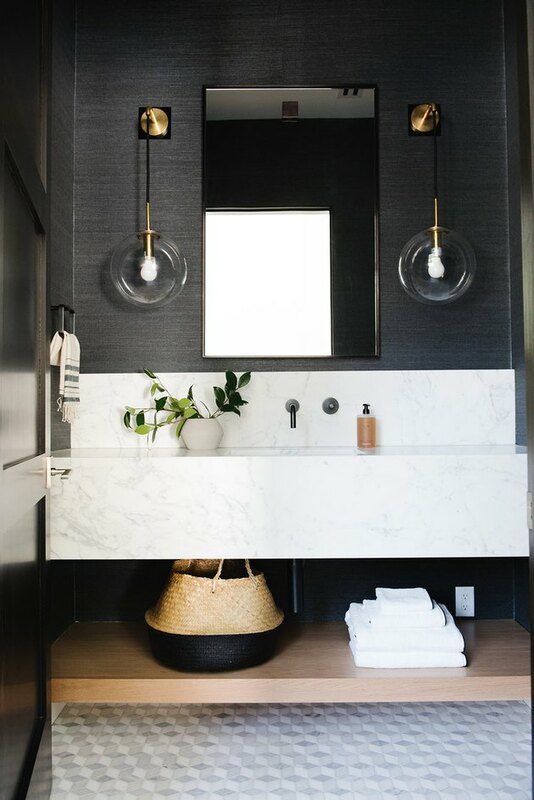 In this half bath, belonging to Shauna from House of Silver Lining, white walls and a floating white marble countertop make the perfect backdrop for unique elements like handwoven baskets and a pendant light with a metallic ombre finish. This half bath proves that you have can dare to be artistic in a small space. 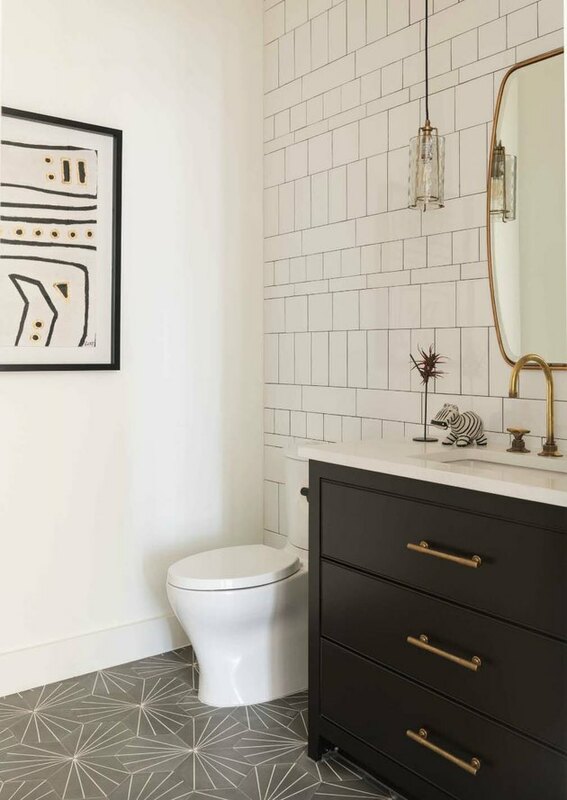 Designer Shannon Tate mixed a graphic, black-and-white patterned floor tile with a large circular mirror and a vintage style oil painting of a woman — and her RBF is spot-on. 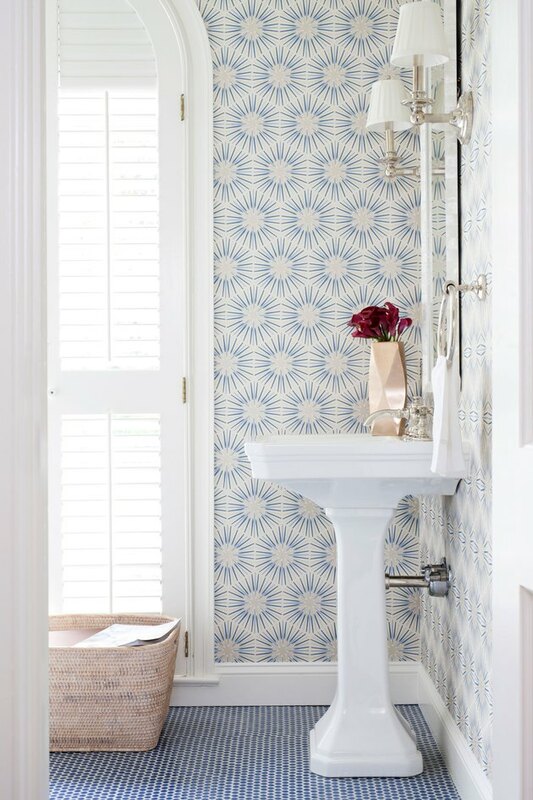 Follow the lead of Joyce from JDP Interiors and choose a punchy, go-big-or-go-home wallpaper for your half bathroom. The retro design doesn't take over the space — in fact, it makes it seem bigger and meshes well with the black bowl sink, faucet, and and wall sconce. In this half bathroom idea, Shea from Studio McGee seamlessly merged farmhouse charm with beach-chic style. In addition, she maximizes square footage thanks to the vanity cabinet's open shelving design. To really put a powder room to work, make sure that every design choice you make is distinctive and pops. The accents chosen by the team over at Matt White Custom Homes each have their own unique flair. 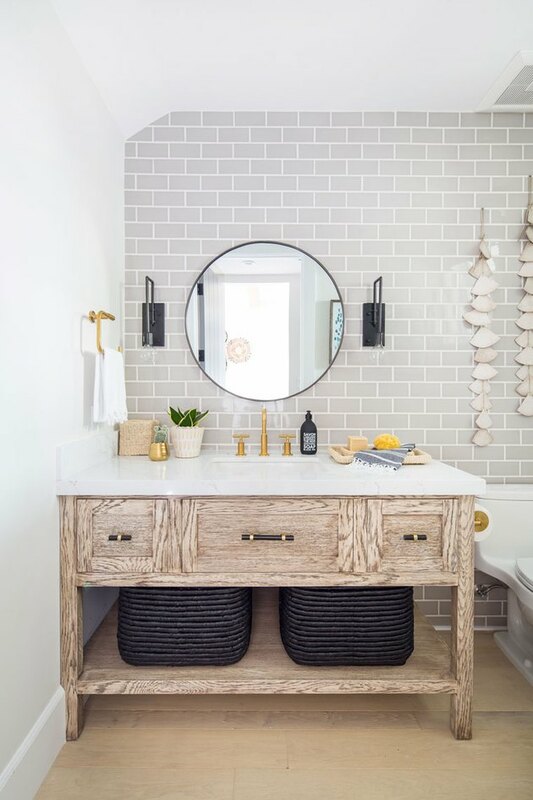 The wood finish of the vanity cabinet is eye-catching and the gray subway tile is a fresh twist, but we are really loving those wall hangings. 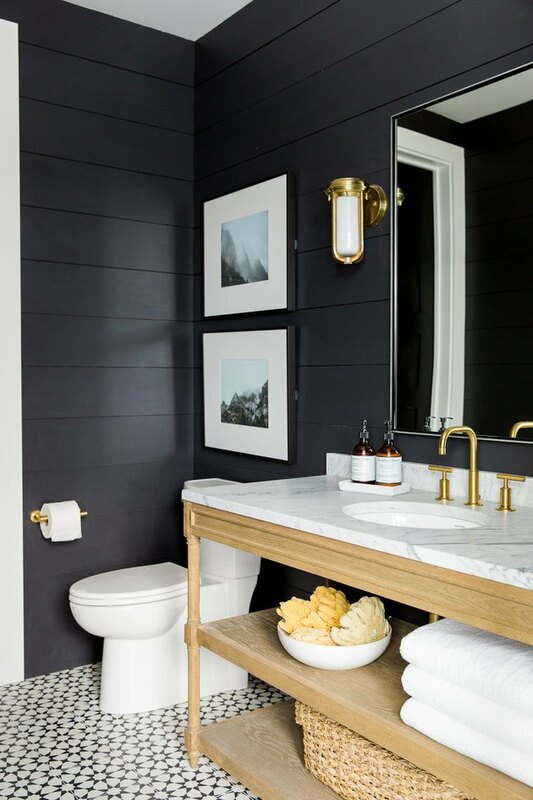 People tend to be afraid to bring black into small spaces, but it actually acts as a great anchor, especially in a half bathroom. The designers over at Brio Interior Design didn't shy away from shadowy hues when they picked out this beautiful, floral print wallpaper. 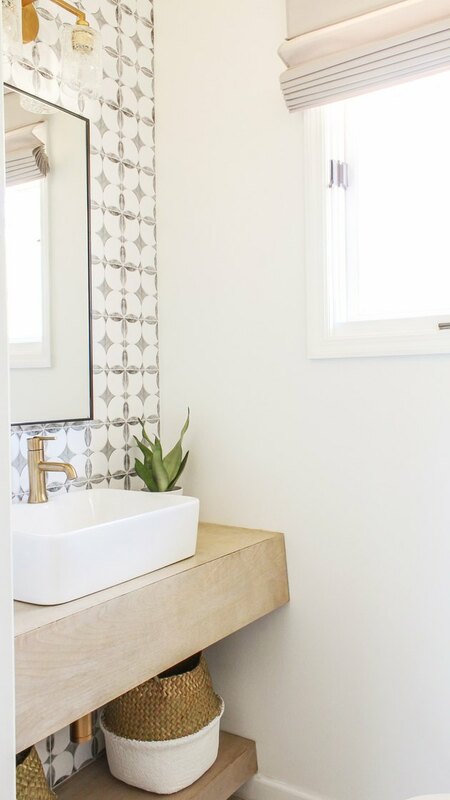 We're kind of obsessed with this half bathroom idea designed by Ali Budd Interiors. The brave, right-this-minute design choices — including a copper-hued mirror, chic patterned wallpaper, black-and-white floor tile, and matching backsplash — don't overwhelm the room. In fact, they enhance it and create loads of visual interest. On the flip side, going with a more subtle approach is a tried-and-true way to create some dreamy white space in a powder room. 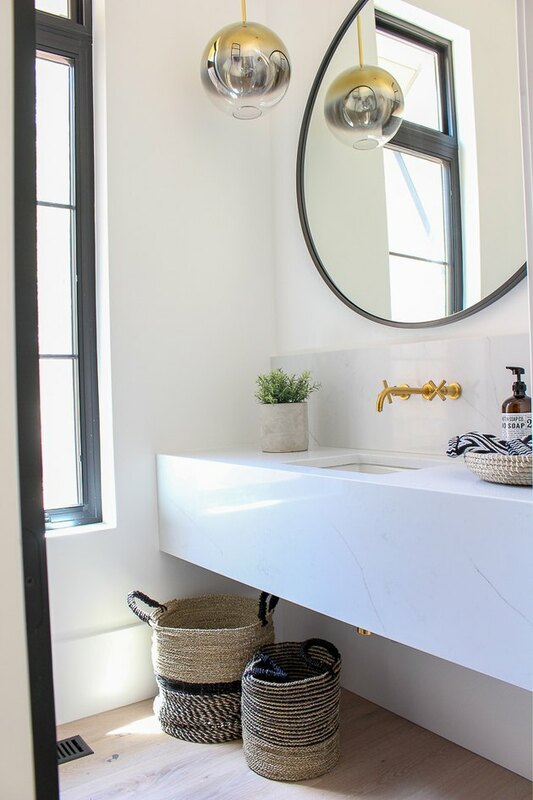 For example, this half bath belonging to Erica Van Slyke of Designing Vibes is oh-so-breezy with its white walls and simple vessel sink on top of a light wood countertop. And let's not forget to mention the pretty cement tile backsplash. 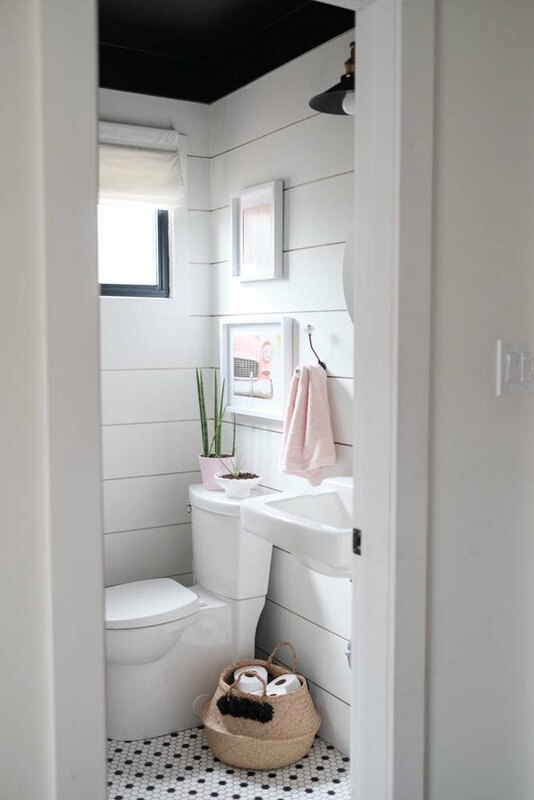 Like we said, white works wonders in a teeny space, and this half bathroom idea dreamed up by Sarah Sherman Samuel is a picture-perfect example. 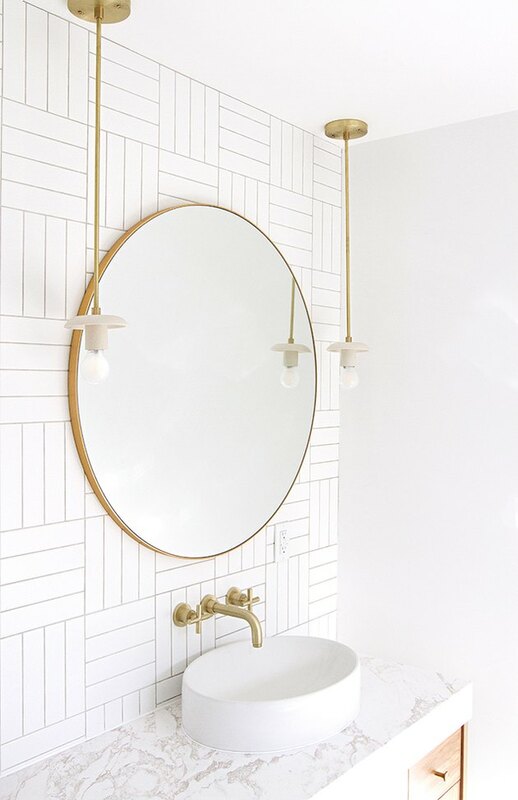 We can't get enough of those delicate, under the radar patterns placed alongside gleaming brass accents. 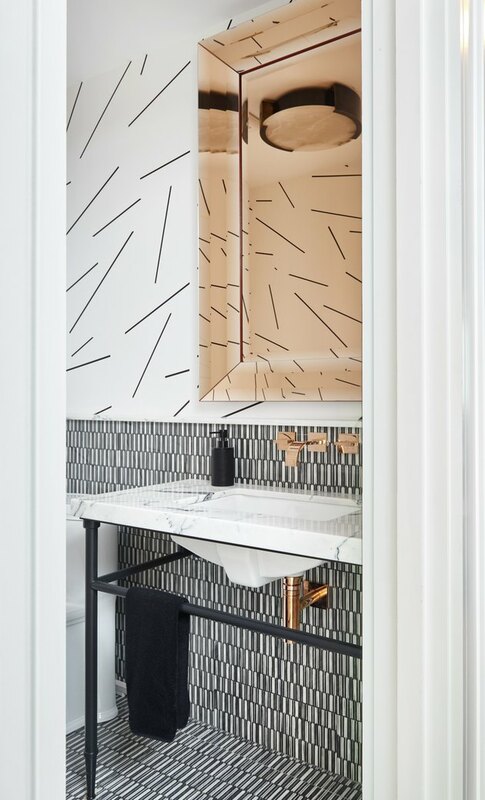 A powder room presents an ideal opportunity to experiment and try out new ideas — like the dog pattern wallpaper in this half bath crafted by the designers at IDF Studio. 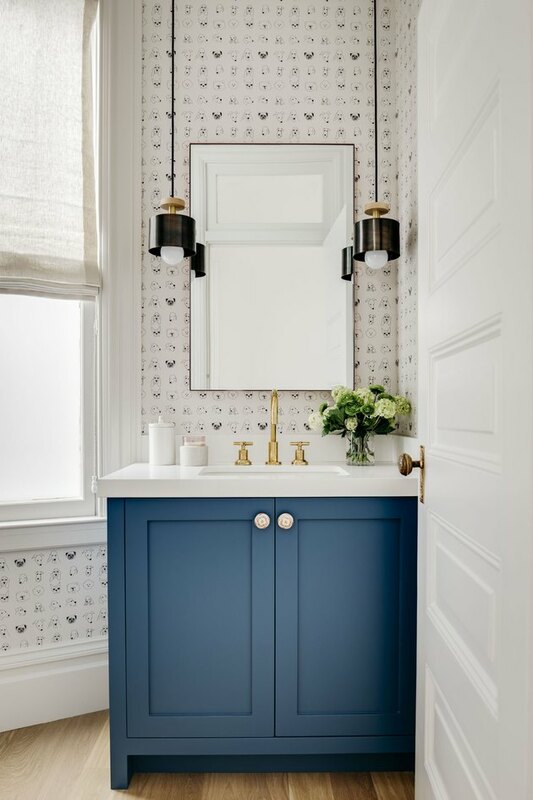 Cheerful blue cabinetry and stylish pendant lights complete the sweet setup. 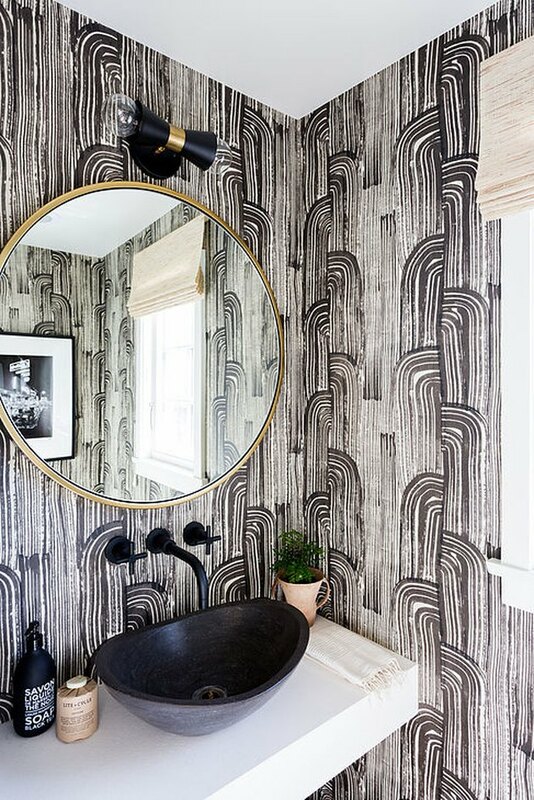 Shea from Studio McGee hit the ball out of the park with this dramatic half bath design. 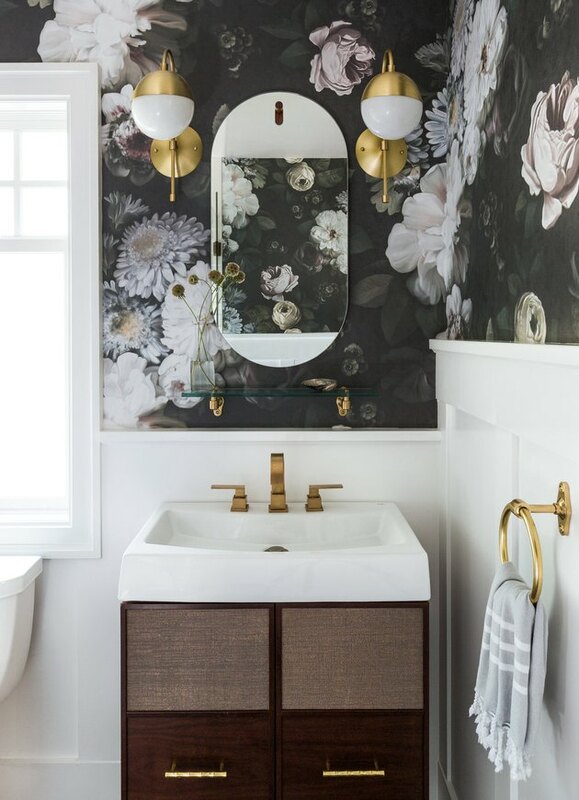 The black grasscloth wallpaper sets a glamorous stage for the stars of the show — a floating white marble vanity and a pair of black and brass globe wall sconces — to shine. Take a walk on the wild side with this half bathroom idea designed by Geschke Group Architecture. Thanks to a piece of tribal artwork, patterned floor and wall tile, and a tiny zebra on the countertop, this space proves that you can mix and match multiple patterns and still have a cohesive design that's far from overwhelming. Thanks to a few design tricks, this half bath looks downright huge. Sandra Meyer of Ella Scott Design cleverly used fresh, bright wallpaper to keep things light; a white pedestal sink to seemingly create more space; and window shutters to let in lots of natural light. From the cool cement floor tile to the jet-black vanity cabinet to those eye-catching wall sconces, the design choices made by London interior design firm Nune are simply flawless. There's a lot of perfection going on in this modern half bath. 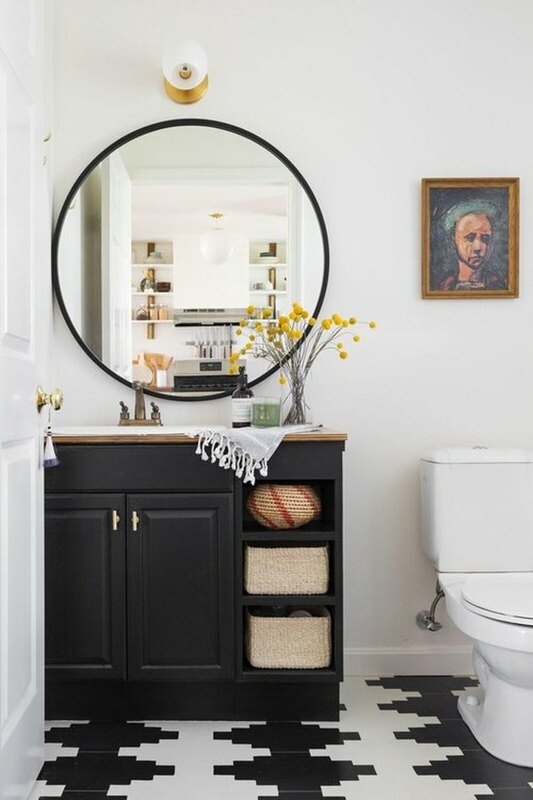 We love the way Thalita from The Learner Observer made her powder room seem a bit more spacious by painting the ceiling black and cladding the walls with white shiplap. 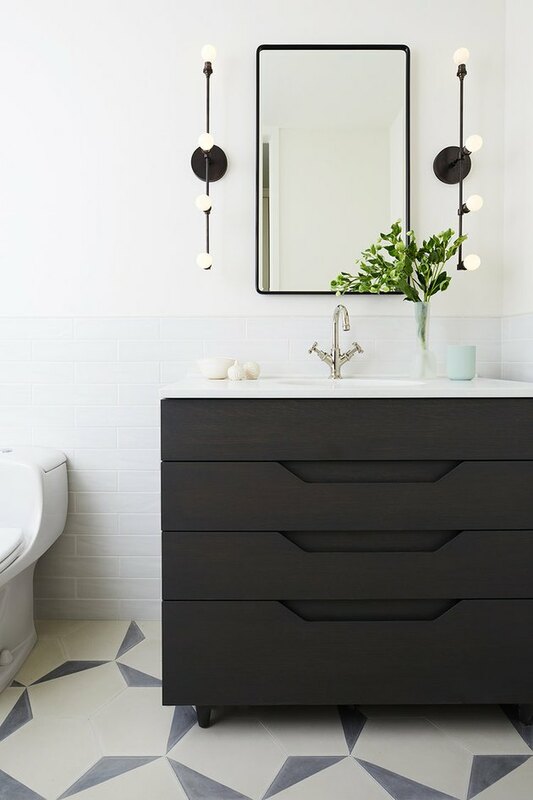 She completed the look by pairing black accents — like window trim, mosaic floor tile, and a wall sconce — with soft pink accessories, resulting in one of the sweetest half baths we ever did see.